Ever wonder what the difference between a shapefile and a geodatabase is in GIS and why each storage format is used for different purposes? It is important to decide which format to use before beginning your project so you do not have to convert many files midway through your project. All files for the shapefile must be stored in the same location with the same name or else the shapefile will not load. When a shapefile is opened in Windows Explorer it will look different than when opened in ArcCatalog. On the other hand, Personal Geodatabases were originally designed to be used in conjunction with Microsoft Access and the Geodatabase is stored as an Access file (.mdb). Therefore Personal Geodatabases can be opened directly in Microsoft Access, but the entire geodatabase can only have 2 GB of storage. To organize your data into themes you can create Feature Datasets within a geodatabase. Feature datasets store Feature Classes (which are the equivalent to shapefiles) with the same coordinate system. Like shapefiles, users can create points, lines, and polygons with feature classes; feature classes also have the ability to create annotation, and dimension features. 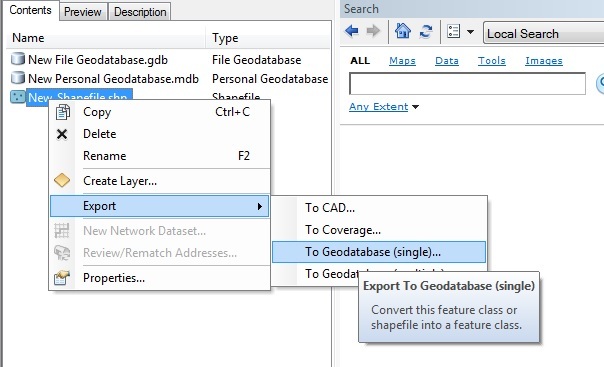 In order to create advanced datasets (such as add a network dataset, a geometric network, a terrain dataset, a parcel fabric, or run topology on an existing layer) in ArcGIS, you will need to create a Feature Dataset. When you copy shapefiles anytime, use ArcCatalog. If you use Windows Explorer and do not select all the files for a shapefile, the shapefile will be corrupt and will not load. 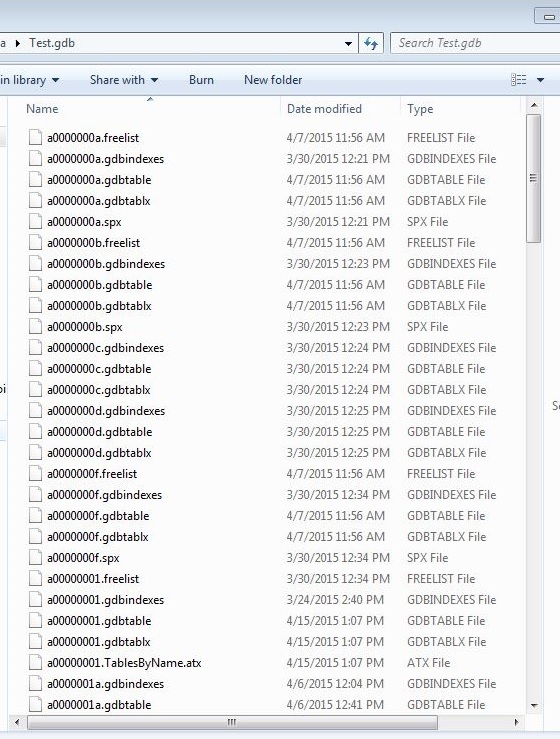 When using a geodatabase, use a File Geodatabase. There is more storage capacity, multiple users can view/read the database at the same time, and the file geodatabase runs tools and queries faster than a Personal Geodatabase. Use a shapefile when you want to read the attribute table or when you have a one or two tools/processes you need to do. 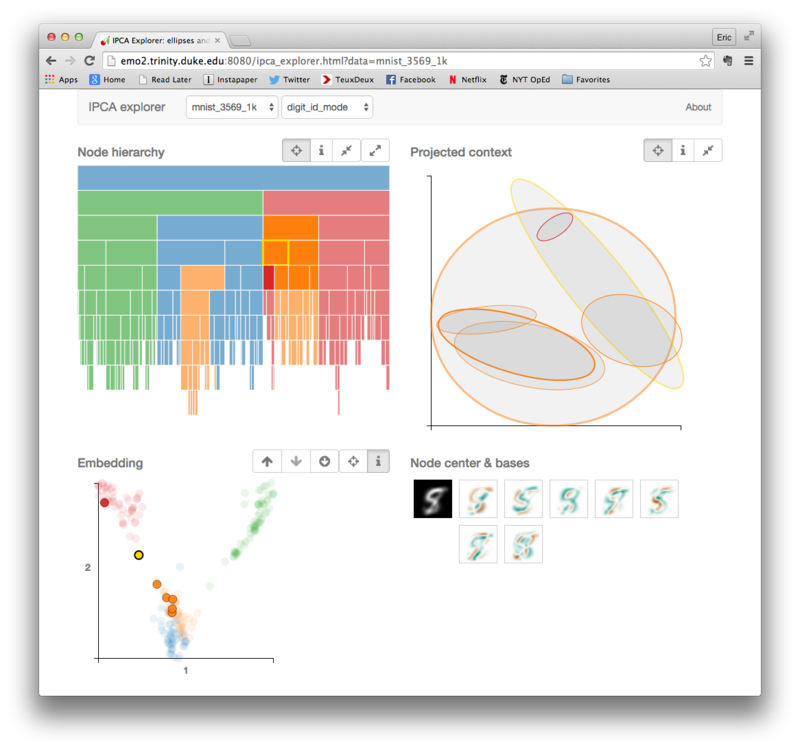 Long-term projects should be organized into a File Geodatabase and Feature Datasets. Data and Visualization Services is proud and excited to welcome Eric Monson, Ph.D., our newest staff member. Eric joins the team as our Data Visualization Analyst, working with Angela Zoss to provide support for data visualization across Duke’s campus and community. 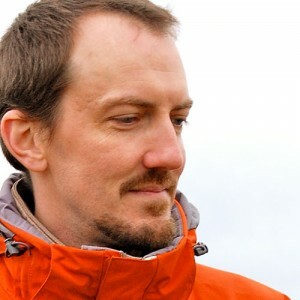 Eric worked for several years under the supervision of Rachael Brady, who was the head of the Visualization Technology Group (now the Visualization and Interactive Systems group), the founder of the DiVE, and a hub for the visualization community at Duke. Though transitioning from work in applied physics, Eric quickly became an active member of the broader visualization research community, sharing his experiences developing interactive visualization applications through online forums and professional organizations. His natural design sense contributes to an elegant portfolio of past work, and his work on projects in both the sciences and the humanities gives him an extremely wide range of experience with different datasets, tools, and techniques. Since DVS began offering visualization services in 2012, Eric has been an active supporter and collaborator. While continuing to work as a Research Scientist, Eric has co-organized the Visualization Friday Forum speaker series, teamed up with Angela on instructional sessions, and been an active supporter of visualization events and initiatives. He is an experienced and patient instructor and will bring many years of consulting experience to bear in this new role. Over the past three years, demand for visualization support has steadily increased at Duke. With an active workshop series, guest lectures in a variety of courses, individual and small-group consultations, and programming such as the Student Data Visualization Contest, DVS is very happy to be able to boast two staff members with visualization expertise. In the near future, we hope to increase our visualization workshop offerings and continue to identify powerful but easy-to-use tools and techniques that will meet the needs of Duke visualizers. Taking advantage of Eric’s background in sciences and humanities, DVS looks forward to being able to answer a broader range of questions and offer a more diverse set of solutions. Please join us in welcoming Eric to the team! As always, feel free to contact askdata@duke.edu with any questions or data-driven research needs.